My first impression of Mr Gabr’s start to the lesson can be summarised into three words: purposeful, warm and knowledge-rich. Image: Mr Gabr teaching. This is from a different lesson. Not the lesson mentioned in the blog. Mr Gabr’s million dollar smile greets children whilst he stands at the threshold of the Classroom. This is a Teach Like a Champion (TLACI) technique referred to as ‘Threshold’. One foot in the corridor to keep track of children walking towards the teacher. One foot in the classroom to ensure that pupils know that when they enter the room they are to be silent and start the work prepared on the whiteboard. Mr Gabr’s eyes are everywhere! The first child enters the classroom, mirroring Mr Gabr’s smile. The pupil walks to his desk and starts thinking about the questions displayed on the board. This pupil silently recites the two definitions written on the board. Another two pupils enter and do the same. Every second counts and Mr Gabr is quick to start firing questions to individual pupils whilst they are organising their books and getting their equipment out, straight into a SLANT position, tracking Mr Gabr. All pupils have now entered the room, at their desk, book and equipment out, Mr Gabr tells all pupils to take a seat. He informs pupils to get writing into their books to answer the questions on the whiteboard. Great demonstration of TLAC’s ‘Do Now’, a speedy review for 5 minutes. Pupils are in a solid routine and start the work without any direction from Mr Gabr. To help pupils Mr Gabr reads out the question, asks for whole class choral response after 3 for the answer to the question. There is a forest of hands up in the air. At Charter, we push to have as many pupils to have their hands up in the air to answer questions. The pupil who gave the mediocre response is asked to repeat his answer using the word ‘ovum’ rather than the word ‘egg’. It’s been 10 minutes of teaching where every second has really mattered. He introduces what will be taught today and dives straight into looking at respiration’s chemical equation. He is very deliberate with wording, and he pre-empts possible misconceptions that pupils may have in advance. For example, he states that in a chemical equation we use an arrow to separate the reactants from the products, not an equal sign. Pre-empting that ‘equation’ is a term used in maths which refers to an equal sign or identity sign being present. He pre-empts that reactants of a chemical equation are on the left hand side of the arrow, and that products are on the right hand side of the arrow. 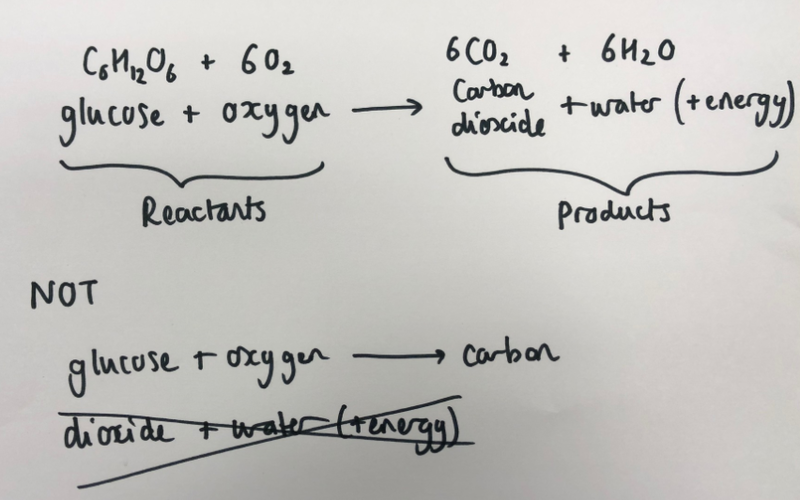 He talks about how when we write carbon dioxide as one of the products in the chemical equation, we write dioxide right below carbon, we don’t go to the left of the margin to start a new line, as it may look like you wrote dioxide to be a reactant. He explains that we write energy as a product but the term ‘+ energy’ must be in brackets, because energy is not matter. Chemical reactions do involve energy. 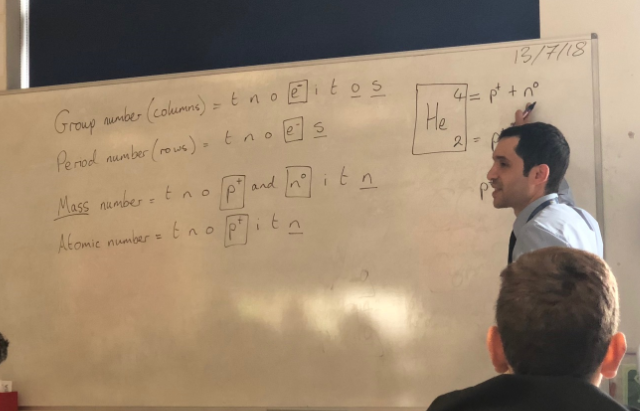 He emphasised the importance of this and showed pupils how to write the equation with energy as a product, and the incorrect way of writing the equation with energy as a product. At Great Yarmouth Charter Academy, we have an open door policy where teachers are welcomed to observe and learn from their colleagues. This invitation to visit extends to local members of the community, parents, teachers and Headteachers far and wide. We have had several visitors come and experience a day with us. This is also an invitation welcoming you to visit our school. Please feel free to get in touch with the school office to arrange a tour.